When it comes to training and diet you're going to find the best formula for long-term success is the one that you can stick to!! There are plenty of diets and routines out there, but not all of them are for everybody. The diet and training plan have a direct relationship with one another between what is optimal nutrition and what is optimal recovery. I see no benefit in someone training 2 hours a day for 6 days a week if they're only eating 2-3 meals a day. There is also no benefit in eating all of the time if you're skipping out on the gym, because then you'll accumulate more bodyfat than you probably want on your frame!! Personally, I usually eat 5x/day. I can handle 5 meals a day and if I were to increase that number of meals to 8-10 then I know it's not a realistic approach for me, nor an approach I could sustain. My days of force feeding myself ended a long time ago. If you create the need for more food then the hunger should be there. The only exception I see with this is for beginners who need to get used to eating more often and what they think is a lot of food really isn't. So my best advice is to do what works for you. If you've been eating twice/day and the goal is to build muscle then start by increasing your meal frequency to 3x/day and eventually 4x/day. From this point it's all about what you can handle. There are certain factors in life that play a large role in eating frequency. For example, if you're a surgeon or in school and have a pretty hefty schedule then it's probably not realistic to be eating 6 meals a day. Therefore just increase the amount per feeding and eat what is realistic for you (maybe 3x/day plus a snack before bed?). Not all bodybuilders eat 6-8x per day and not all bodybuilders avoid carbs in the evening time. I've talked about this before and I'll touch on it again, but the body operates on a continuum. Your body doesn't just say “Ok this is what he fed me today so I'm going to respond.” It doesn't work that way, your body responds on a continuum. There have been countless diets that put carbs first thing in the day, solely around workout time, or carb backloading (where carbs are consumed later in the day). The truth of the matter is that people get results from them all because of the continuum I'm talking about. When it comes to working out you need to work out in a way that works with your schedule and a way that works with your diet. I had trained only once every 3rd day while preparing for my last bodybuilding competition and came in shredded and actually looking larger and fuller than in the past!! I threw away all general consensus when it came to traditional training and I had no problem getting the results I was looking for. Most of the time my routines were full upper body workouts with low volume and high intensity, and once every 7-12 days I threw in a leg day. I did this because my legs retain a lot of fluid and muscle trauma after I train them, so instinctively I lowered the frequency of leg training. Nobody told me this was the best way or the route I should go, it was all instinctive. You'll learn what works for your body as you get further along with this. It's good to look at all types of training and there is something you can take away from almost every style of training. I can take something from powerlifting, crossfit, high volume, low volume, high rep, low rep, extreme stretching, yoga, and include some principle of every style into my routines. It's the willingness to learn and the open-mindedness to try new things that often lead to your success with physique transformation. We all know the guy who swears by just one style of working out and most of the time they never change. You see the same people month after month at the same ol' grind but they never look any different!! What I've found is that by doing things in a realistic manner that fits within the parameters of your life and obligations, you tend to stick to the routines and diets better. I hate to admit this (because bodybuilding is a large part of my life) but there is usually a direct correlation between how often I'm in the gym and what I can accomplish outside of the gym. I may feel too drained to do something around the house so things may slip. I may not think as sharp and clear if I'm expending too much energy in the gym 6x/week. Nobody wants to admit that something they love doing may be hampering other areas in life. But I came to this realization a few years back and when I adjusted my workouts and diet in a more manageable way my body did not slip one bit. I actually got better because consistency got better as I learned to make it work with my life. 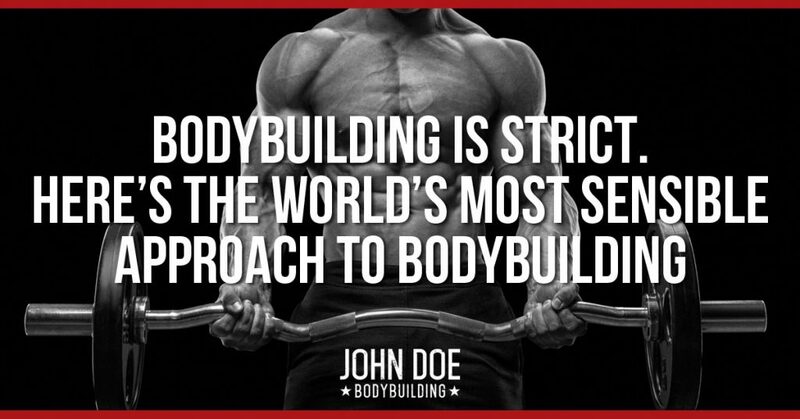 Bodybuilding is something that should enhance your life, not hinder it. Do you know why barbells and dumbbells were even invented? It wasn't for cosmetic reasons, it was to help people recover from injury and BUILD BACK UP. Barbells and dumbbells were not intended to CONSTANTLY BREAK YOU DOWN!! As I became more seasoned in the gym I started focusing more on overall health and recovery. I used to have periods of over-eating and no cardio, or “bulking phases” without abdominal training and/or cardio. I no longer train that way. I always focus on cardio and ab training in any plan I take on. However, there were times in the past when I was so focused on overall mass that I neglected some of these things. Did it work? Yes indeed!! You see, that is the double edged sword within all of this. If I had a food phobia or a “fat phobia” then there is no doubt in my mind that I would not have attained the size I have today, or the strength. For a beginner the foundation needs to be laid out, and sometimes the foundation requires extreme measures. But if you've been in the gym longer than about 5 years consistently then I would focus on all aspects of fitness. I would not neglect cardio or abdominal training once the size was there. 90% of the size you attain you're going to get within the first 5 years of consistent weight training. From that point it becomes a system of diminishing returns. Plateaus become harder to break, required caloric intake seems impossible to achieve to grow more, and recovery becomes harder and harder as you train harder and heavier. This is when you need to take a step back and look at everything as a whole. 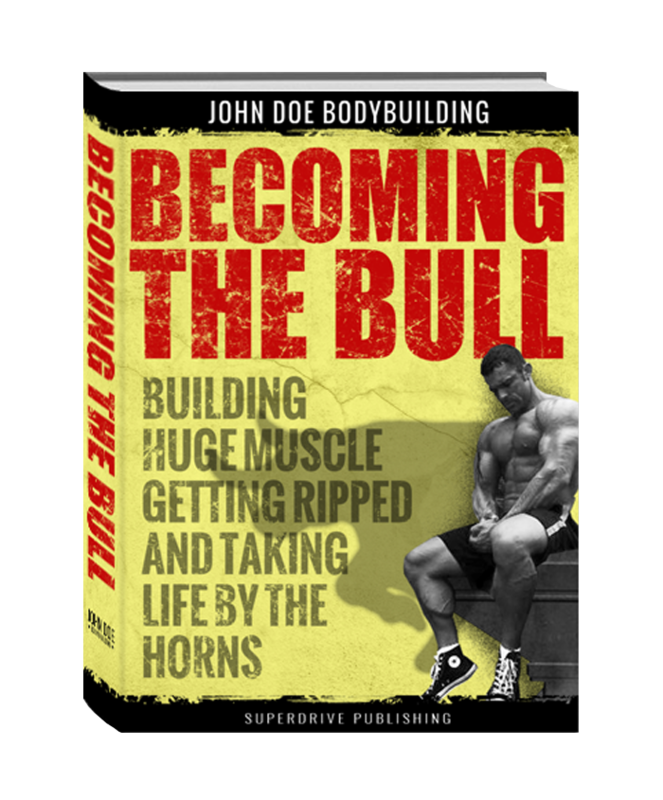 If your life consists of more than just bodybuilding (which would be most people) then this is when you need to approach training and dieting in a manageable way. If it takes protein bars or the occasional shake then fine, it's not as good as real food but better than skipping out right? If it takes lowering your gym frequency to 3 days a week then do what is realistic for you. What you don't want is obsessive-compulsiveness to run your training and diet rather than what really gets results in a realistic, long-term approach. I promise you that if you let obsessive-compulsiveness run you then say goodbye to successful careers, relationships, and opportunities that pass you right under your nose!! Find a realistic approach and stick with it!! It's better to come up with a manageable system than to take a yo-yo approach where you're hot one month and cold the next. Thanks John Doe! Took some notes on this one. Great article! I also tried to cut the workouts short to one hour a day as school days are coming. More great articles, Sir John! Superb article once again man, some great content on this site for sure! The consistency and regular eating is definitely key. The biggest mistake noobies make after their baby gains are done is consistency. You have to be consistent in order to grow. Also, find out what works best for you. Some freaks actually work best being vegan. Or they think so anyway. it’s crucial to experiment and find out what brings you the best results. Couldn’t agree more. It’s so easy to get obsessed with this lifestyle. become very rigid for the purpose of staying in shape, and start saying no to many enjoyable things in life – a drink with friends, a night out, a meal at a good restaurant, social life etc. If you need to lose weight and get in shape then it may be okay for a while, otherwise it’s pointless. The goal of having and maintaining a great physique must never end up ruling every other aspect of your life.